European art music is constantly in danger of being nullified by the intellectualism with which it is conceived and received, by the ‘discourse on music’, by the preoccupation with shoehorning it into clearly defined ‘genres’, subgenres, categories. This obsession, perhaps useful in commercial classifications or scholarly investigation, is utterly inadequate for the understanding of a vital and ephemeral phenomenon such as musical expression. If I have learnt something from long years of collaboration with traditional musicians, it is that sound and music should be understood with other categories of the spirit. This project, which we have toured for some time now to enthusiastic reactions from audiences, is intended to have the restless, tragic, superficial, melancholic, cheerful, wild and ironic character of the Gypsy – everything happens here and now. The past no longer exists, and ‘no one knows what the future holds’. That extract is from a sleeve essay by viola da gammba master Vittorio Ghielmi for his new album 'Gypsy Baroque'. His thoughts resonate with recent musings here about how walls between music genres are now higher than ever. But what is particularly significant is the assertion that sound and music - not just music alone - should be understood with other categories of the spirit. Recent genetic research has indicated that the Roma gypsies of Europe are descended from dalits - low caste 'untouchables' who migrated from the Indian sub-continent more than a millennium ago. 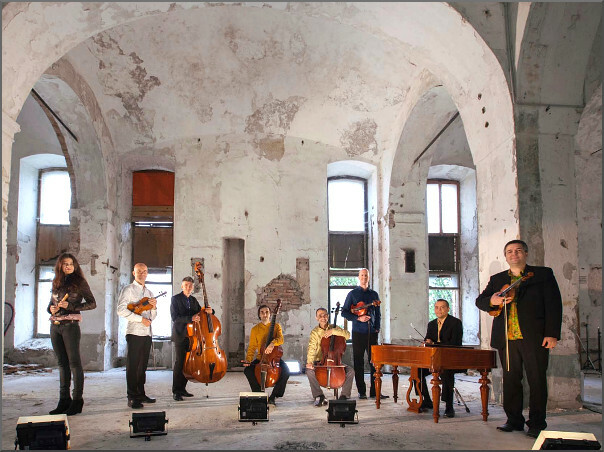 The Vedantic teaching of Nada Brahma explains that sound and not music is god, and listening to just a few minutes of this new CD shows that Vittorio Ghielmi and the musicians of Il Suonar Parlante Orchestra (seen above) agree on the preeminence of sound. When 'Gypsy Barroque' is played through a high quality audio system the listener is transported to the sacred acoustic in St Albrecht, Austria where the album was recorded. This is in direct contrast to so many contemporary recordings where the musicians are shoehorned into the listening room by close miking, dead acoustics and the ubiquitous use of headphones for studio monitoring. Recorded sound quality has become the Cinderella of the digital age. How many of the critics who delight in slamming the acoustics of London's Festival and Barbican Halls ever critique recorded sound quality in their album reviews? Indeed, how many of them review albums on audio systems with the sonic quality of the Barbican and Festival Halls, yet alone of the sonic quality of the gold standard defined by Snape Maltings or Amsterdam's Concertguebouw? And how many critics review albums using monitor quality speakers correctly aligned to reproduce a soundstage analogous to the recording venue? In this age of the selfy, how about some listening room selfies from the critics? - it would make a change from their serial advocacy of spending £250 million plus on a sonically perfect London concert hall. 'Gypsy Baroque' is an important album because it transcends genres and is a welcome reminder that the art of great recorded sound is not entirely dead. But there is another reason why this album is important. Back in 2006 I wrote a widely-read post headlined Roma - the forgotten Holocaust victims. The restless, tragic, superficial, melancholic, cheerful, wild and ironic music of 'Gypsy Baroque' is a timely reminder that in these supposedly inclusive times we need to widen the definition of forbidden music. No review samples used. My social media accounts are deleted. But new Overgrown Path posts are available via RSS/email by entering your email address in the right-hand sidebar. Any copyrighted material is included for critical analysis, and will be removed at the request of copyright owner(s).